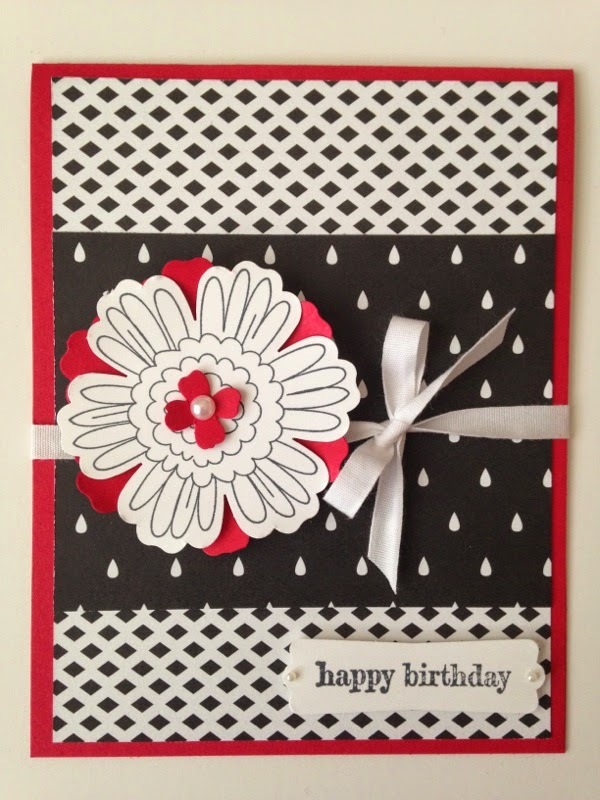 Stampin' in the Sun: Happy Birthday using "
Today is my sister-in-law's birthday so this card is for her! I used the Back to Black Designer Series Paper as the background on the Real Red card stock. I put two different patterns together to make this design! Do you love the flower? It's from the So Very Happy stamp set and it has my favorite little guy on it - an owl! If you have the Blossom Punch, it coordinates with it. I punched a plain real red flower and layered it underneath. Oh, and the new Itty Bitty Accents Punch Pack has that mini red flower that I put in the middle of the white flower. So CUTE! See you tomorrow for one of the display board creations I made!